This past Saturday, I attended the Blog Better Boston Style Summit in the Boston.com offices, which I assure you was a real treat (not just the literal kind, re: cupcakes). Not only was I looking forward to learning tons of great tips to make Prim and Propah a better blog but I was also looking forward to seeing some of my Boston blogger pals in the flesh. Some ladies I had met before and were super excited to see again and others, I had yet to meet in real life. Any way you slice it, as much as this was a day to learn it was also a day to kibitz with my ladies. I had such a fun day and hope that everyone enjoyed their day as much as I did. First things first, I have to thank London Times for the awesome printed ponte shift dress to wear to the event (which is now on sale, people!). Isra of The Frugalette also wore a London Times dress and we both definitely agreed that these dresses were comfortable and a great selling point for us was "machine washable", hello but most importantly, they were super cute. I pulled from my closet to build the rest of my ensemble. These L.A.M.B. heels spoke to me at the GILT Warehouse sale a month or so ago... and the rest was history. The bag and earrings? Hello, TJ Maxx... less than $35 for the both and a local company to boot! The outfit was a great combination of stylish and comfortable, which seemed like the perfect recipe for a busy day! Snaps to Amy and Alana, the brains behind Blog Better Boston and the Style Summit. Not only did they pull together a wonderful event but they also brought some fierce fashion for the day as well. I did take some pictures with my real camera but turns out, they were mostly practice shots from the photography session (which was super informative) so I recapped some of my fave phone pics, some of which made the Instagram cut, some not so much. I don't usually wake up this early on weekends so I started my day with my Dunkins and the schedule. Fab sponsor, Lulu's, had a super fun style scavenger hunt, with prizes. Miss Agnes from Spoons and Stilettos was rocking Chevron so I am sure many gals snapped a shot of her that day. Another New England fave of mine, and sponsor of the event, Lux Bond and Green, had a table full of sparkly things to provide distractions but I was most drawn to this Belle eToile pendant. I seriously have not stopped thinking about it. PS. You will likely see an Obsession Alert post about the line later this week. Miniluxe was doing polish changes all day long so Alana sat down and got her nails did, which was much deserved if you ask me. Everyone looked sassy with their new nails. See this here watch? Yeah, that was my Spin to Win from Lulu's and I think it will fit quite nicely into my every growing jewelry and watch collection, don't you think? One fun thing about the day was all the tweets with the hashtag #BBBos would rotate on the screens in the main media room. Unfortunately, one of my more unfortunate tweets from the day sat on the screen long enough for me to take a picture. See previous note about unfortunate tweets of unfortunate pictures #Creepy. The sponsors added that fabulous bit of fun to the day. Thank you to Lulu's, Roster, Miniluxe, Lux Bond and Green, City Sports, KM Hudson, InSights and more. You were awesome! Sweet ladies I needed to hug again: Shauna of Like So Pretty and of course, Boston Glove Events, Smita of Hogger & Co., and Alison of Long Distance Loving! What a fantastic recap post! I really, really enjoyed meeting you! Once I kick this cold, we should go out and do something fun! I am so glad we met too! And thanks again for the pictures, you rock! Awesome to meet you at #BBBos !! This was an awesome round-up, hope to see you again soon! It was a pleasure to meet you and I really loved reading your post. XO! 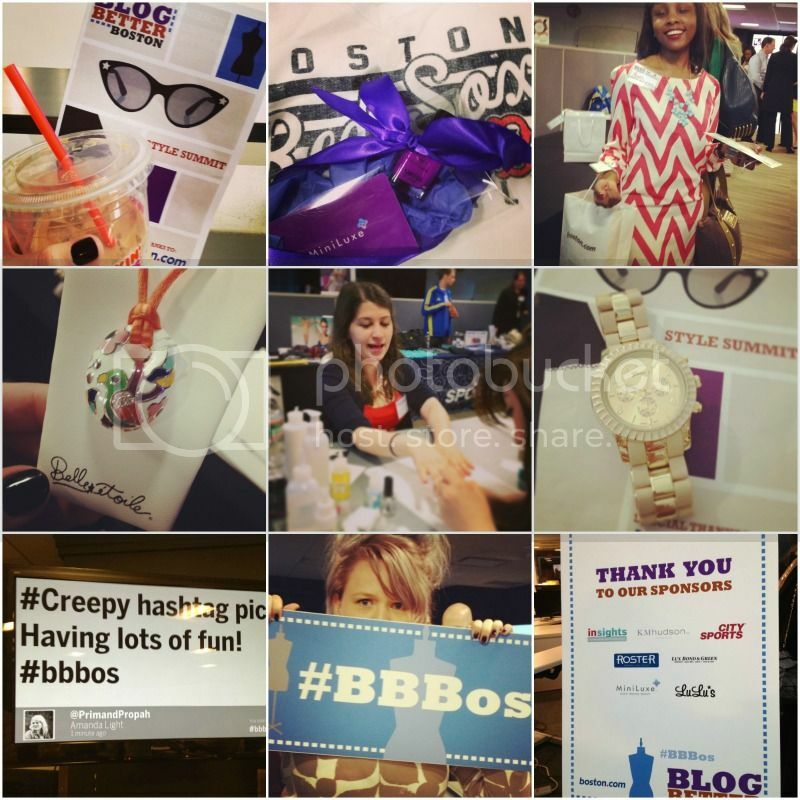 was bummed to miss BBBos this year - great recap! It was great to meet you too! Like I said you were probably pretty popular in that sassy dress right?! No, You looked great! So happy to have met you too! There is always next year right? I don't even think we've met yet have we? It was a pleasure meeting you this weekend too! You were an absolute doll and looked amazing in that dress! Hope we run into each other again soon. You are a sweeter doll! I do hope we run into each other again too! Wow! That dress looks amazing on you.